"Funny thing about cookbooks: There doesn't seem to be as much interest in publishing history as there is with other genres - and I'm talking about buyers and sellers. When I was doing research for BookThink's Irma Rombauer Author Report, I reached out to some cookbook specialists for assistance with the alarmingly complex publishing history of The Joy of Cooking and got absolutely no help from them. It's possible that they didn't want to help, but I think you will agree that we booksellers are almost always happy to help other booksellers who are looking for this kind of information. One wonders that they just weren't able to help. In any case, I soon happened up Anne Mendelson's Stand Facing the Stove: The Story of the Women Who Gave America The Joy of Cooking, and this proved to be a font of JOC publishing history, greatly helping me produce, to date, what appears to be the only Irma Rombauer bibliography extant." I do take publishing histories of cookbooks seriously because I've also learned two other things. One, there are collectors out there for whom this is important, and if you take the trouble to describe a given cookbook accurately and hardly anybody else doesn't, guess who they are going to buy from? And two, yes, there is no shortage of collectors for whom this isn't important. Often what is important to them is replicating a copy of a cookbook they grew up with, and its specific edition is of little or no importance to them. However, never forget that part of our purpose as booksellers is to teach, and teaching sparks interest, at least potentially - and perhaps that buyer of a ca. 1970 Betty Crocker cookbook will grow an interest in its first version published in 1950 if we take care to explain why it's important. 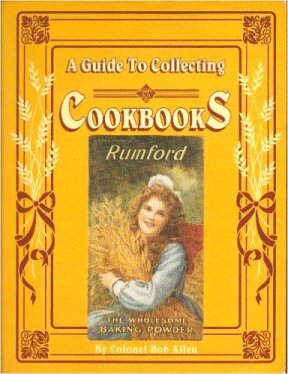 What is perhaps striking about the cookbook genre is, though huge, how few bibliographic resources there are, and many of these are focused on pre-1900 or older cookbooks and/or are scant on detail, that is, some are little more than checklists and of no use at all for identifying First Editions, say. But there are a few good ones. If you have an interest in taking things more seriously, the following bibliographies are what I consider to be the essentials, and you know what they say about bibliographies: If they do no more than help score with only one book, they more than pay for themselves. Here are what I consider to be the essentials. American Books on Food and Drink: A Bibliographical Catalog of the Cookbook Collection Housed in The Lilly Library at the Indiana University. William R. Cagle & Lisa Killion Stafford. 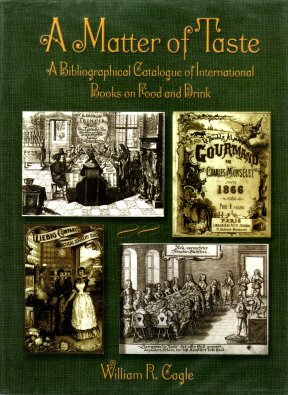 A Matter of Taste: A Bibliographical Catalog on International Books on Food and Drink. William R. Kagle. I'm starting with what I consider to be two of the most useful cookbook bibliographies for US and European booksellers. These catalogs are compilations of thousands of American and International titles representing the notable John Talbot Gerron collection sold to and in part donated to The Lilly Library at the University of Indiana some years ago. 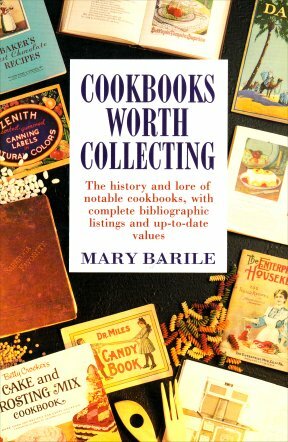 This is no lightweight collection, and some of the cookbooks included are the only known copies. Both catalogs are massive, authoritative and unusually detailed in their descriptions, including complete collations and bibliographical citations. If you could afford only two bibliographies, these are what I would recommend. If there is any disappointment at all, it's that the American catalog includes titles no newer than 1950, the International, 1962. 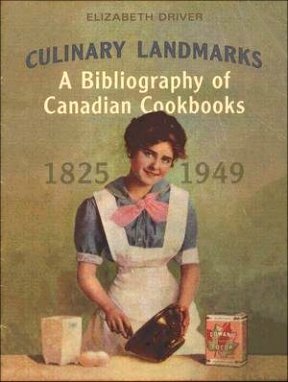 Culinary Landmarks: A Bibliography of Canadian Cookbooks, 1825-1949. Elizabeth Driver. The Canadian equivalent of the above. Massive again, and collations are included, along with, when applicable, mentions of American editions. 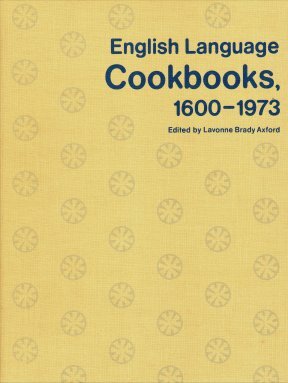 English Language Cookbooks: 1600-1973. Lavonne Brady Axford. Axford's bibliography has been a standard in the genre since it was first published in 1976. It's a comprehensive compilation of both American and International titles in English. Detail isn't as impressive, but dates of First Editions, pagination and some supplemental information is included. Gastronomic Bibliography. Katherine Golden Bitting. First published in 1939, the focus here is on American and International titles predating this. Bibliographical detail is more or less equivalent to Axford, but considerably more effort has been expended describing the contents of the books featured. Also, unlike most cookbook bibliographies, privately printed organizational cookbooks published by societies, lodges, churches, etc., are included. 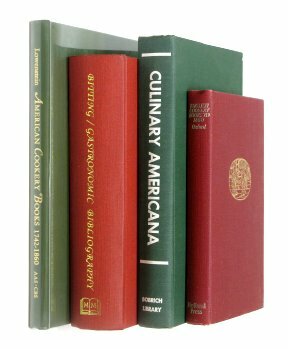 Bibliography of American Cookery Books: 1742-1860. Eleanor Lowenstein. 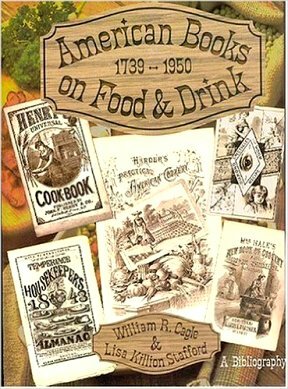 An updated revision of Waldo Lincoln's American Cookery Books: 1742-1860, this covers the years noted in the title and its descriptions are similar in treatment to Bitting. Culinary Americana: Cookbooks Published in the Cities and Towns of the United States of America During the Years From 1860 Through 1960. Eleanor and Bob Brown. Detail is similar to Axford, but there is effort here, as in Bitting, to include privately printed organizational cookbooks. English Cookery Books to the Year 1850. Arnold Whitaker Oxford. As the title implies, the emphasis here is on European titles predating 1850 in English. Though not as comprehensive as most, there is considerable detailing of contents. Along with the above bibliographies are several useful resources that are worth considering. 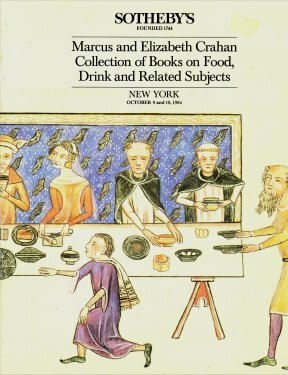 The Marcus and Elizabeth Crahan Collection of Books on Food, Drink and Related Subjects: New York, October 9 an 10, 1984. Sotheby's. Auction catalog featuring 786 lots, primarily 19th century and earlier cookbooks from an important collection. A Guide to Collecting Cookbooks. Colonel Bob Allen. A collector's guide short on bibliographical detail but useful for identifying high spots, and there is an unusually informative, 7-page section on Betty Crocker, including a complete checklist of titles. Cookbooks Worth Collecting. Mary Barile. Again, a collector's guide useful for indentifying high spots. Its strength, however, lies in its strong historical content. Finally, speaking of cookbooks, if you missed my Special Report last year that featured ten of the most common, higher-dollar cookbooks encountered in the field, you can purchase it here for $9.99.